2721 Edmonds Road Boonville, NY. | MLS# S1121071 | Benn Realty LLC -Since 1968, and now with offices in Old Forge and Remsen to serve you better. Handcrafted in 2010, this timber frame home sits perched on a slight hill overlooking the Black River, where deep, navigable water can be observed from 3 sides of the home. The open great room boast a new ledgestone fireplace, 2 levels of windows, hickory floors, natural maple walls, muted Adirondack lighting and plenty of natural sunlight. The kitchen has custom cabinets, tiled floor and a natural granite peninsula encased in timber. A natural cherry and walnut staircase with wrought iron railing leads you to the second story, where you will find walnut floors in the loft area and birch walls, all with a gorgeous view of the water! Two bedrooms, and a full bath with slate tile complete the second floor. 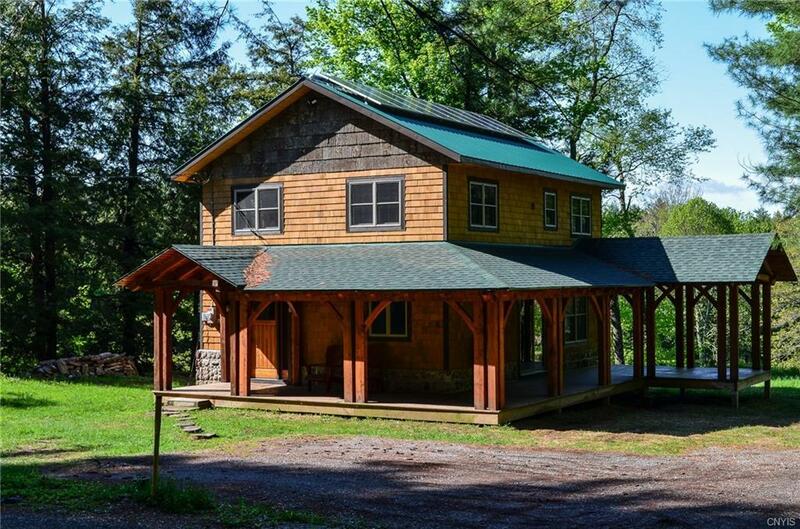 Sit on the timber wrap around porch and breath in the Adirondacks! Nearest Cross Street: Sheen Rd.